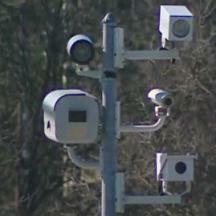 Would you like to watch speed camera trials, perhaps in preparation for your own case? All speed camera hearings are held at the District Court building located at 8552 Second Avenue in Silver Spring. The most convenient and least expensive place to park is at the county-operated Cameron Street Garage that is about one block from the courthouse. Cash and credit-cards are accepted at the payment machines. After entering the building, you will have to pass through a metal detector and possibly be padded down. You will be required to remove your belt and outerwear when you pass through the metal detector. You will not be asked to show ID and no one will ask who you are or why you are there. Cell phones may be taken into the courtrooms but they must be turned off. Hearings generally run from about 9:00 a.m. to 11:30 a.m. and 1:00 p.m. to 3:00 p.m., depending on the caseload and how fast the judge wants get out the courtroom. You can sit anywhere in the courtroom except for the first row and the area that is reserved for law enforcement officers. You are allowed to take notes. Voice recording devices may not be used in the courtroom. You will not be allowed to read books, use Kindles, Androids, or IPads, do knitting or sewing, or perform any activity that is not court-related. You can, however, read paper law documents, paper law books, and your own notes. When bailiffs see someone taking notes, they occasionally ask if the note-taking is court-related. All that you need to do is say "yes" and they'll leave you alone. For the speed camera court schedule for other counties, call the District Court for your county.